Conflict is normal in any family or organization. Yet, many avoid conflicts, even if that avoidance affects relationships or how the foundation operates. 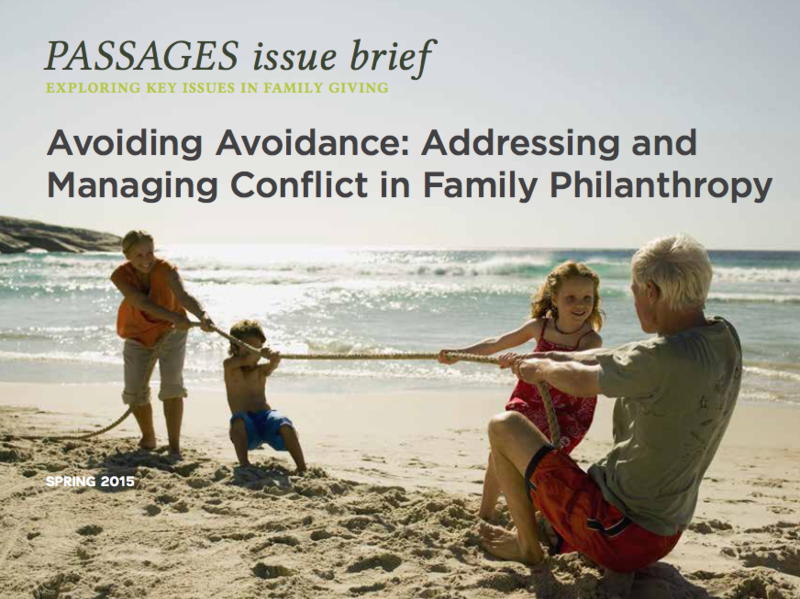 This Passages Issue Brief shares examples of (1) what the most common conflicts are in family philanthropy; (2) what creative tactics some boards use to perpetuate the conflict avoidance; and (3) how boards can use simple tools to address conflict in a healthy, productive way. COPYRIGHT NOTICE: You are purchasing a multi-use license for the PDF of this Passages Issue Brief from the National Center for Family Philanthropy. This means that you may save or print up to 10 copies of this article for other members of your board or staff only, and may distribute up to 10 copies in whole or part in any form (printed, PDF, etc.) to others affiliated with your organization. Please note that this license does not extend to individuals not affiliated with your organization.